so i dont want to buy a new front panel for the car because i dont know how i plan on going with the body. But mine is a little mangled front the previous owner or the owner before that i guess they decided slamming the front end into the little parking block was good for the resale value. any good ideas? Im not apposed to pulling it off to bang it out either. 05-Now -- BMW is "The Ultimate Driving Machine"
Yoshi wrote: pix of damage? I think harbor freight has a body work hammer kit for $20-$30. Ive had one for years. 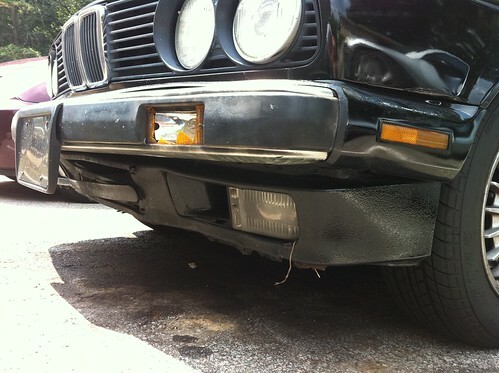 Used it to get my front valance pretty close when I got rid of the db's. You can get stuff close if you take your time. ponycarman wrote: I think harbor freight has a body work hammer kit for $20-$30. Ive had one for years. 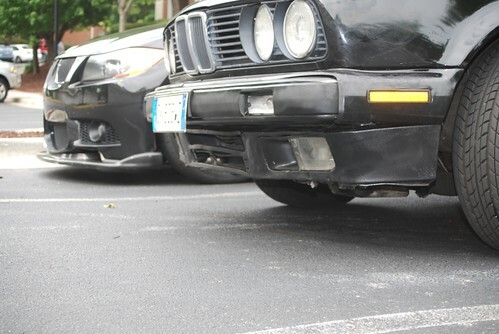 Used it to get my front valance pretty close when I got rid of the db's. You can get stuff close if you take your time. The damaged turn signal was caused yesterday by a tracter trailer that almost hit me and a puckup in front of me when it decided to come into our lane and run us both off the road.. I didnt realize there was any damage until this morning when i took the photos. Wow that is pretty bent up. Might be easier to just find a replacement. Check around in the local junkyards. Buying off the forums can be costly because of shipping. ponycarman wrote: Wow that is pretty bent up. Might be easier to just find a replacement. Check around in the local junkyards. Buying off the forums can be costly because of shipping. yeah it is, i dont want to waste money if i plan on replacing the front end anyway... thats why i just wanted to bang it out straight a little..
Oh ok well just a hammer will do hehe. get the cow catcher from lip. It covers over that valence anywho. Yeah I've got one too hehe. But it needs some work. yeah, it would take a ton of time to get that thing straight. Mine was nothing compared to that and it took me a good 4 hours of working to get it near perfect. PM Blunt on r3v, he can get some pretty goo deals on OE parts. M20_fever wrote: yeah, it would take a ton of time to get that thing straight. Mine was nothing compared to that and it took me a good 4 hours of working to get it near perfect. PM Blunt on r3v, he can get some pretty goo deals on OE parts. I am probably going to find one, hopefully cheap... i looked under the car and it is destroyed... Ill just get another one, get one of them volvo lips and tuck the bumpers. I'll be hitting the parts yard this weekend in search of more, but your going to need to get that valance a lot straighter than that to mount one. M20_fever wrote: I'll be hitting the parts yard this weekend in search of more, but your going to need to get that valance a lot straighter than that to mount one. 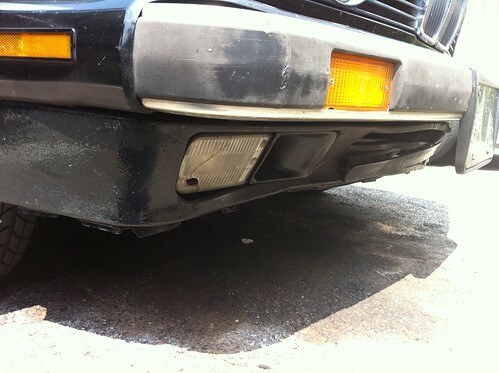 its hard because i have nothing to go off of.. i am picking up another valance but no luck locally. i really dont want to pay a fortune to have one shipped. If i get a lip maybe i will be more motivated to get the front end taken care of.